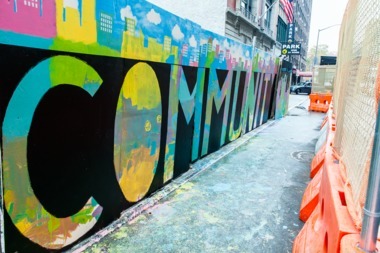 UPPER WEST SIDE — A block that’s all but been taken over by construction on both sides of the street got a colorful mural Wednesday painted by local kids from the nearby JCC Manhattan. More than 70 kids from the JCC’s nursery and afterschool programs painted the wooden construction barrier put up earlier this year in front of 221 W. 77th St., a 26-unit condo building that’s in the works, according to a spokeswoman for developer The Naftali Group. Artist Jason Griffin drew the outlines for the 75-foot-long, 8-foot-tall mural, which was organized around the theme “Building Community” and features bright street scenes painted by the kids. Griffin and JCC staffers were seen putting the finishing touches on the mural well into the evening Wednesday. The mural will stay up between Amsterdam Avenue and Broadway “for the foreseeable future,” the spokeswoman said. Construction crews are still excavating and preparing the foundation at the site — work that’s blocked off part of the sidewalk on the northern side of the street. The developer is also construction another residential tower across the street at 210 W. 77th St., where work is much further along. The 18-story condo, which topped out earlier this week, is 70 percent sold, according to a release. Apartments there start at $4.59 million. Access to the southern part of the sidewalk has been blocked for months. Last winter, the FDNY had to build a cage to house its truck because construction made it impossible to back in and out of its West 77th Street fire station.